Inspired by both personal recommendations and a book club assignment mishap, I delved into famed blogger Fredrik Backman’s bestselling story of a hopeless curmudgeon (very similar to Victor Meldrew from the BBC series One Foot in the Grave which you can watch on YouTube at the hyperlinked location) and his one-man-fight against the world, A Man Called Ove. Originally chosen as our February read, shifting schedules moved poor Ove all the way to April, but I had already started on the novel and had absolutely no intention of setting it aside for a few months. With the first few pages the almost Brit-com like sense of sarcasm mixed with bitterness was compelling both laughter and ironic introspection. Ove loves to hate the world and we, with him, enjoy watching this feisty old man give all the annoying salespeople, bureaucrats, busy bodies, and judgmental so-and-sos a crisp telling off. A Man Called Ove starts with that unique Backman sense of subtlety and dry humor. Ove has decided to start off his usually structured day with the purchase of some newfangled technology – an iPAD. Ensuing is a confrontation between the salesman (who attempts to explain new features with all the enthusiasm of facetious techno-speak) and the ever-obstreperous troglodyte – our very own old school Ove. Eyebrows raised, readers start laughing and shaking our heads, sinking back in our chairs and getting ready to see all the annoying personalities from every day existence get what’s coming to them. We love Ove for saying what he thinks and taking things way too far and already within these first few chapters, something indefinable beyond the humor is pulling us, even though we don’t fully know it yet. We don’t know (or frankly even care) where the novel is going and yet magically we are with Ove, partly for the comedy and partly for the sheer joy of insult, even when he picks on us “modern” readers. Ove’s the angry old man next door who despite all the prickliness seems to have something of substance within him, an inexplicable accumulation of experiences that make him just as approachable as he is oddly off-putting and discomforting. Don’t even try to make sense of these warring sentimentalities, just accept that the book somehow makes you both care for and laugh at its hopelessly stuck-in-his-ways protagonist from the first sentence. And so the hook is set and we are reeled in with chuckles and irony, subtly slipping readers into Ove’s ordered routine until the sheer emotional complexity behind the processes is revealed. The novel is shockingly deep, taking a grouch who is attempting (and being thwarted) at various methods of suicide and revealing the tender human core, the dependency on others, and the effects of true cruelty evident in a heartless medical system and a flawed bureaucracy. 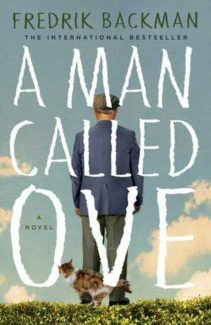 A Man Called Ove is dark and yet, in the end, oddly hopeful (a relief). The sardonic tongue-and-cheek rebellion of Ove becomes something we no longer laugh at but instead champion as we learn the details of Ove’s life and what happened to his wife. All in all, he has the appeal of all failed rebels. Along the way, an entire cast of characters comes in to play. We have the next-door neighbor, an Iranian named Parvaneh, who is a pushy extrovert with an amazing ability to see the depths and subtleties of those around her. Despite her luckless husband’s general buffoonery (ranging from U-Haul mishaps to simple homecare transformed into injury), the couple proves themselves as something more than nice, adopting the recalcitrant Ove, who, as part of the process becomes more known to both himself and readers. In the end, Parvaneh’s children are Ove’s gateway to lost chances and ultimately, forgiveness which breeds true understanding that to live and continue accepting the struggle is the ultimate form of bravery. Other individuals, including a long time enemy once considered a best friend, a broken boy looking to impress a girl, and a flea-bitten feline show that Ove, despite his solitary nature has a large heart and a sense of accountability. He will not choose himself first, despite the overwhelming nature of his own pain and the cascading torment of internal grief. This comes partly from an old-fashioned idea of goodness and a definition of responsibility but mostly from a long life filled with similar incidents and a startling ability to feel for others. The gruff exterior rebuffs those who would get close, but this painted picture is not one so much of selfishness as selflessness and the overwhelming experience of loving and loosing. A Man Called Ove was touching both for its compassion and hopeful realism. Backman doesn’t paint a picture of a beautiful world, yet he shows the beauty that can be contained even within the deepest ugliness. Yes, it’s about how one person can make a difference, but not in the eye-rolling, kumbaya sense. It’s realistic and in many ways dark, yet the strength of the narrative is that, despite everything, there is always hope and redemption for those who accept it. Even more poignantly, Ove’s story unveils those we see, and discount, on an everyday basis. The tendency is to avoid unpleasant, grouchy, bitter people yet thought never goes behind what these exteriors are hiding and what damage has been done both by the mere process of living and by the selfishness of others. In its conclusion, our lone hermit has been enfolded in a cocoon of affection and while he remains distinctly Ove, and the narrative slides into the bittersweet middle ground of life, everything has changed. Even in death, life seems brighter as with Ove we have opened our eyes to the complexity and multifaceted nature of a world consumed simultaneously with both pain and joy.